Got to admit…. it’s a struggle! My current goal is to lose 25 lbs to get back to my healthy weight so that my body doesn’t self destruct. One battle I fight is getting proper nutrients in my body. I make an effort to eat fruits and vegetables daily, but there are definitely days when I skip out on getting what I need and when I skip, I SKIP. To keep the world of fruits and vegetable intake exciting, I researched different healthy smoothie recipes. Something I noticed mentioned frequently on one particular smoothie recipe site was “Flaxseed” and I wondered to myself, is that bird food? Fertilizer? Oh no, can’t be because I’ve seen it before in health food sections. 🙂 So, I did more research on it A*K*A searched http://www.google.com for things that looked legit (i.e. WebMd 😉 ….oh I also read the package too). After reading more about it, I realized that this was something I really needed in the pantry! There are a lot of benefits. ***Disclaimer*** I am no nutritionist, trainer, or anything like that. It contains Omega 3 which can help with maintaining a healthy heart and healthy cholesterol levels (definitely need because of health history). It’s rich in fiber..um, well we all know what that does. Flax contains lignans which reduce the risk of breast cancer in women and prostate cancer in men. The lignans alter the way your body metabolizes estrogens into safer forms. 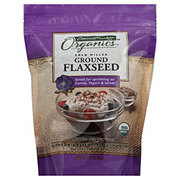 I’ve been using ground flaxseed in my smoothies all week, but flaxseed oil would definitely provide a smoother texture. I usually drink them for lunch and it helps me feel full. Of course with all things that provide health benefits, you need to consume regularly to reap benefits. There is also the risk of overconsuming, so do your research! Good for you and best wishes in your journey. I know of a friend who was advised by the doctor to take flaxseed to treat constipation as it increases bowel movement. And she says, it works.